Directorate of Treasuries and Accounts office has issued certain instructions in the memo No. N1 /10389 /2012 cited on implementation of electronic payments on pilot basis in respect of bills pertaining to Treasury establishment and hostels of welfare departments in District Treasuries and 9 Sub Treasuries. A screen for capturing the bank account details of all beneficiaries i.e., DDOs, employees and third parties is made available in HRMS. The documentation with pictures provided here for ready reference. The Deputy Directors of all District Treasuries are requested to complete the data entry in respect of all beneficiaries pertaining to Treasuries and Accounts Department immediately. Memo No. 138/36/TFR/2014 Finance Dept Dt. 19/02/2014. As per Memo No. 138/36/TFR/2014 Finance Dept Dt. 19/02/2014. Govt. has decided to implement electronic payments to credit the amounts directly to the beneficiaries bank accounts in respect of all bills processed through treasuries. All DDOs are presently presenting the bills to the Treasuries electronically using Treasury Human Resource Management System(HRMS) package apart from physical copy of bill. Now, In view of decision to implement electronic payments, the DDOs have to submit the following details along with physical and electronic copies of bills to the Treasury. 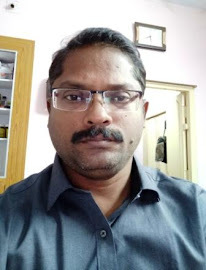 The DDOs shall feed the bank account details of all beneficiaries like employees, DDOs bank account details, third party details through Treasury portal i.e. https://treasury.ap.gov.in/ddoreq. The DDOs shall take a print out of the beneficiary details from the above treasury site and enclose it to the bill under proper signature. The Treasury will inform the status of each bill in the above portal from time to time based on the information received from bank. Whenever a transaction is failed the DDOs have to submit the correct beneficiary bank account details both electronically and physically(Hardcopy) for reprocessing it for payment. The DDOs have to login with their User ID and Password. Go to left Side of the Screen and Click on Pay Bills "+" Button Icon. Then select “Benf Bank details” (Beneficiary Bank Details) sub module under “Pay bills” Module. The DDO code in the above screen will be automatically populated with your DDO Code. DDO current account in Treasury Bank IFSC code and DDO ACCNO fields respectively. Bank Branch MICR Code(If Not known Enter “NONMICR”). The beneficiary details i.e. 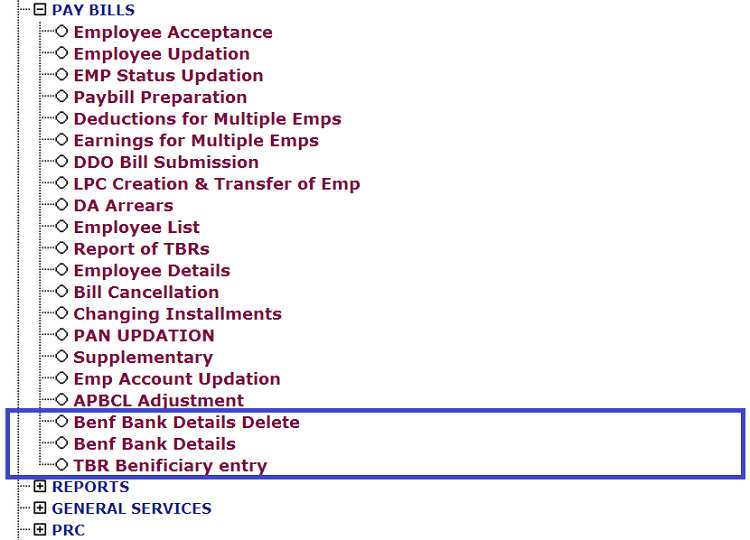 the Bank account numbers and other details of all employees, the DDO have to be entered in the above screen i.e. “Benf Details Entry” in Pay bills module of HRMS package. For every employee, the details have to be fed by the DDO. Type employee code in the above screen. The name of employee will automatically be displayed. Type IFSC code of the bank branch in which the employee is maintaining bank account for receipt of his salary and other benefits should be provided in “IFSC code” field. Once the data is fed, the name of the bank branch will be displayed for cross verification. The MICR code will be automatically be displayed in the “MICR code” field. The DDO has to enter the bank account number of that employee. In this case, no employee code is required. Skip this field. Type the party name clearly without any errors. Type IFSC code in “IFSC code” field. Name of the branch will be displayed for cross verification. MICR code will be displayed automatically. Enter the bank account number of third party and press “Submit” for confirmation. The DDO can view the list of beneficiaries using “LIST” button. 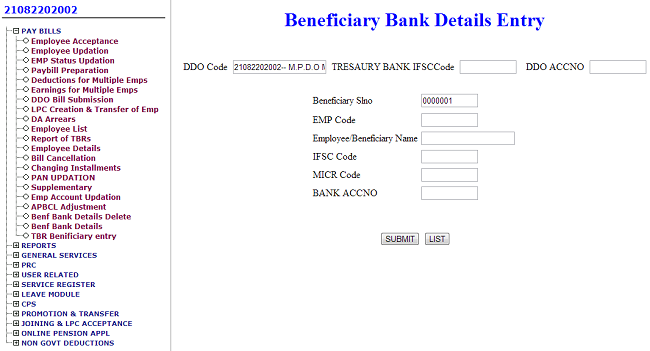 After completion of beneficiary details entry, DDO check the details by click on “LIST” Button in Benf Details Entry module. 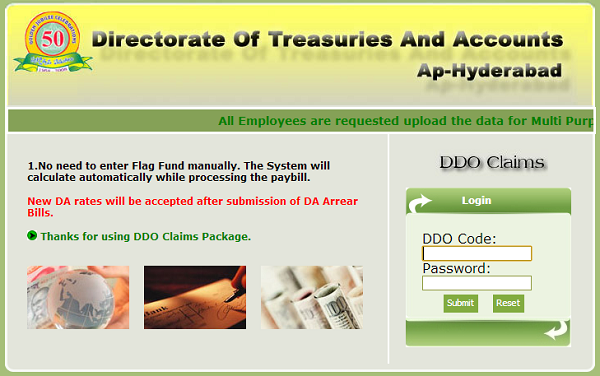 DDO can check the bank account details of all employees in the below screen. number or other data the data will be deleted by the ddo as follows. Again click on Benf Bank Details Delete(Beneficiary Bank Details Deletion). In the above screen ddo will delete the any employee data by select “Delete” option. 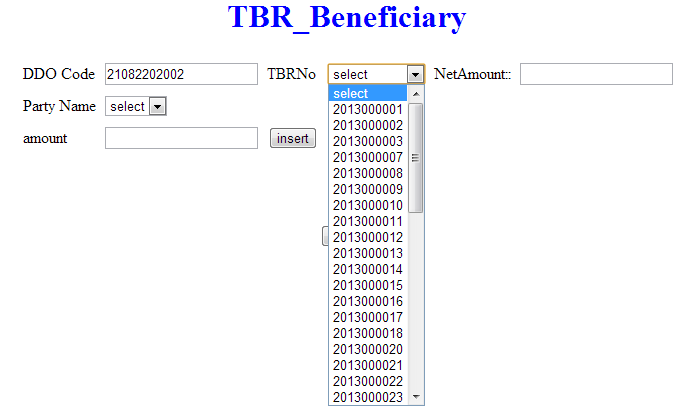 DDO has to select the generated TBR Number from the drop down list, then the system displays the TBR number’s Net Amount and all employees details on the Screen. The DDO has to be entered the Beneficiary Details for that generated TBR Number and finally submit them if everything is correct, Same procedure for all Bills. 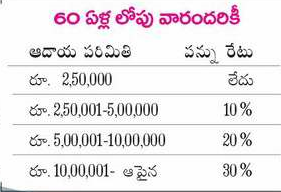 This is an example taken from the Power point presentation of Deputy Director, District Treasury, Nellore. DDO's are requested please wait for certain orders will be issued from the State Treasury Department Officials for implementation of electronic payments.